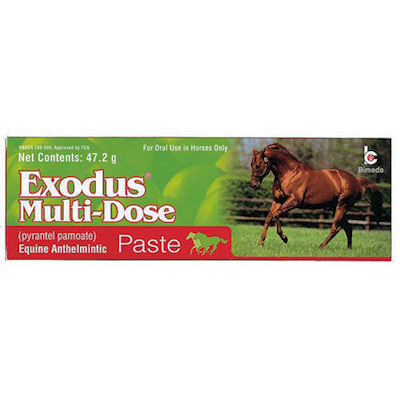 Generic Strongid Paste (Exodus Label-Bimeda) 47.2 gram Multi-Dose tube for the removal and control of large and small strongyles, pinworms and large roundworms in horses. Apple Flavored. Safe for use on foals 2 months of age or older, pregnant mares and breeding stallions and all other horses and ponies. Each tube will deworm two 1,200lb horses - Big Savings over the 1 dose tube. Orally administer 1/8th syringe for horses up to 300lbs, give 1/4th syringe for horses 301-600lbs, give 3/8th syringe for horses 601-900lbs, and give 1/2 syringe to horses 901-1,200lbs.